Magnolia grandiflora, a photo by Ayala Moriel on Flickr. White magnolias are now in season, and with my Floriental week came students from different cultural background, including a Southern native who loves magnolias even more than I do! I also learned that the red seeds of magnolia have a resinous-sweet, spicy and fruity odour of their own (which I'll be following closely in the next couple of weeks). 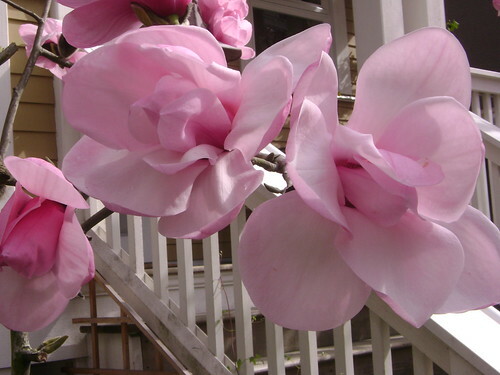 Magnolias deserve far more attention in the perfume world than they do. This glorious flower has such a unique persona, with a light yet complex floralcy underlined with the robust fruitiness of peach and fresh apricot, delicate citrus-like freshness, and a certain almost leafy-herbaceous quality. 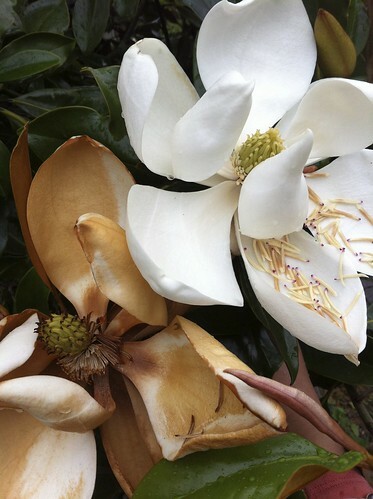 Some magnolias (as the Magnolia grandiflora pictured above) may even smell aldehydic-oily-skin like. Michelia Alba, a photo by Ayala Moriel on Flickr. Where Arctander lacks, Poucher fills in much more detail about magnolia speices and history, as well as the odour of their flowers: "the perfume of the majority of species of the Magnolia is exotic, and the fragrance resembles that of a ylang-lily complex, with a shading of clove and a top note of lemon" (W.A. Poucher, "Perfumes, Cosmetics and Soaps Vol. 2, 1959, p. 165). In his compounding notes, he suggests using a muguet-like base, substituting nerol for rhodinol; and using high quality citral for the lemony effect. Magnolia (Magnolia grandiflora) is an iconic flower of its native American Southeastern states of Virginia, Florida, eastern Texas and Oklahoma. According to wikipedia "M. grandiflora contains phenolic constituents shown to possess significant antimicrobial activity. Magnolol, honokiol and 3,5′-diallyl-2′-hydroxy-4-methoxybiphenyl exhibited significant activity against Gram-positive and acid-fast bacteria and fungi. The leaves contain coumarins and sesquiterpene lactones. The sesquiterpenes are known to be costunolide, parthenolide, costunolide diepoxide, santamarine and reynosin". As it turns out, white magnolia headspace scent primarily owes its characteristic balance to three different molecules: verbenone (18%), isopinocamphone (9%), and (Z)-jasmone (27%). While the first two are green and camphoreous-medicinal, together with the (Z)-jasmone creates a completely new and utterly floral harmony that is greater than the sum of its parts. Michelia champaca is a whole other story though related closely to the magnolias we are familiar with in North America. I've discussed champaca at great length at a previous chapter of the Decoding Obscure Notes series. However, I'd like to add here comments on the chemical constituents - which are quite different and explain quite well some of its complexities. Champaca's headspace contains methyl benzoate, phenethyl alcohol (a light rose alcohol), phenylacetonitrile, indole (accounting for its animalic undertones) and methyl anthranilate (which creates its similarity to heady orange blossom and ylang ylang), along with sesquiterpenes, e.i. (E,E)-alpha-farnesene, ionones, e.i. dihydro-beta-ionone, (Z)-methyl-epi-jasmonate, and other aromatic esters. White magnolia (Michelia alba) is in fact a hybrid between Michelia champaca and Michelia montana - both of which originate in Indomalaya ecozone (South Asia, Southeast Asia and parts of China). Most of it today is produced in China, either as an essential oil or a CO2, a rather mobile liquid with a light amber-orange colour and an intensely fruity yet fresh, peach-like aroma and slight green and clean notes and hints of fresh gardenia. It neither has the typical "white floral" quality (methyl antrhanilate), nor any animalic qualities, which is unusual for flower essences, and is refreshing departure from all the jasminey indole, paracresyls and the like. 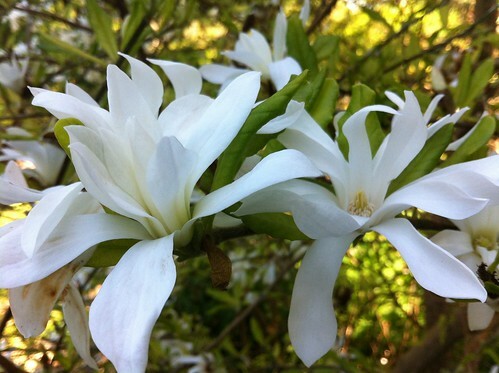 Magnolia is Maurice Roucel's signature note, which discerning noses might notice in many of his perfumes, i.e. Tocade, l'Instand de Guerlain). Some of my favourite perfumes contain magnolia - such as Opium Fleur de Shanghai. White magnolia is one of my absolute favourite notes, ever. I've incorporated it into numerous perfumes and compositions (including the now-defunct Magnolia Petal, a magnolia soliflore): from the heavy and sultry Razala, to the light-as-sea-breeze of New Orleans. It's a supporting note in The Purple Dress, which is centred around her east Indian relative, champaca; it is part of the fantasy notes of Hanami and l'Écume des Jours; and gives a balance to rosewater and vanilla in Cabaret; and in a custom-scent with osmanthus and Japanese incense for my dear friend Noriko and her jewelry line Dancing Leaf Designs.